Home Made Milk Kefir vs Store Bought- What Is The Difference? 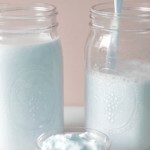 Kefir Products- Homemade or Store Bought Milk Kefir? People often ask whether they should buy kefir products in Canada at the local grocery store. My answer is always, "It depends." The best kefir is the one you have and drink. So the first criteria is often simply to know whether you will take the time to care for the kefir culture, or if ready-made is better. Don't get me wrong, it is not a lot of work to keep a milk kefir starter healthy, but it does require a daily milk change, and some stirring. Not much work, but still more than some people are willing to take on. If you do have 5 minutes a day to care for a milk kefir culture, then milk kefir grains will be a very worthwhile investment for your health. 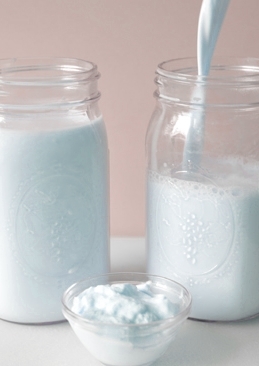 You may have heard that home made kefir milk is better for you than store bought milk kefir. Or you might just assume it is better without knowing why. Store bought milk kefir is factory made using a very few specific bacteria strains. In fact it is more similar to yogurt than it is to authentic kefir milk made from heirloom milk kefir grains. Foods sold in the store need to be standardized. It is important for manufacturers to produce a consistent product. They limit the numbers of bacteria, and inhibit their growth. They also completely leave out the beneficial yeasts that are in the products. All of this is to provide consistency, but also to prevent bacterial activity from causing enough gas that the container will explode. When you start making your own kefir, you will appreciate what that means. As bacteria and yeast devour the milk sugars, they put out gases like CO2 that create an effervescent (fizzy) quality. I always make kefir with a loose fitting lid so the gases do not build up. Manufacturers, however, need to properly seal their product. That could be a recipe for disaster. So here is the breakdown of bacteria and yeast found in traditional kefir milk made from authentic heirloom milk kefir grains like we sell to Canadians on this site. That's a great start. 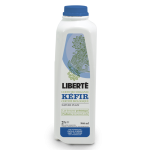 If you think you do not have time to care for milk kefir grains starter culture, then Liberté kefir may be for you. So now, when someone asks you, "What is the difference between homemade milk kefir and store bought milk kefir, you can tell them, "The difference is microscopic!" I’ve been wondering about making kefir at home, as I now drink it daily. Not expecting it to be too much trouble, as I used to make yogurt all the time, which is a lot more preparation. I’m careful and follow instructions. One reason I switched to kefir is the much greater variety of bacterial organisms it contains, compared to yogurt. I guess what I want to know is whether the home made version will be VERY different in flavour or texture, from what I have become used to ? I have come to enjoy some tanginess and those bubbles, but when I read things about home made refit being slimy’ or mucus like, that does not sound appetizing at all. The brand I buy now is made by M&C Dairy, local here. Full fat, very thick, effervescent. I started out with LIberte flat fruit flavoured kefir, but now can’t stand it, as it’s much too sweet and no bubbles :-). M&C makes fruit flavoured ones, mostly 2% milk. Much less sweet, quite effervescent, but since I am trying to cut back on sugar, I mix a quarter cup of the fruit flavour to 3/4 cup of full fat plain and have come to really enjoy that. Often drink it twice a day. The savings on home made would be welcome and I’d probably buy organic milk to make it, where I have not been buying organic from the store, it is just too expensive. Do you think it’s going to be difficult to adjust to the difference between homemade and what I am now used to ? Btw, how long do kefir grains remain useful ? I learned that yogurt cultures tend to wear out with time. You can reculture quite a few times but eventually you must use a fresh starter again. Do kefir grains continue to grow and produce provided they are cared for properly, or must they be replaced every so often ? Sorry this is so long, but if you can give me some idea of an answer, I’d be most grateful and buy some to try. I always prefer to buy Canadian. Hi Karen: Kefir is not the way that person described. In the summer, the texture can change a little 🙂 The kefir you make at home will be different consistency though than what you buy. I can’t find an ingredients label online for MC Dairy kefir, but they usually have carageenan and/or guar gum which makes it thicker. True kefir that you make at home will be dependent on the type of milk, how much fat, and also the grains themselves etc. Flavor- Of course if you are using flavored and sweetend kefir from the store, then what you make at home is different. I do not like drinking plain milk kefir. I strain off the grains and put my kefir in a blender with some berries and sweetened vanilla protein powder. It gets thick and fluffy in the blender- like the best strawberry milkshake you have ever had. SO good! The grains last forever, and they just get better. I’ve had mine now for many years and they produce the most delicious kefir! I bought store bought kefir but accidentally left in car for 3 hours in about 10degrees Celsius temperature. Is this product now spoiled? If it can no longer be consumed, are there other uses for it so it does not go completely to waste? Hello I doubt that would spoil it. I would not even worry about milk under those conditions. 🙂 But you can trust your nose. Spoiled kefir smells rotten, while store bought kefir smells like yogurt.